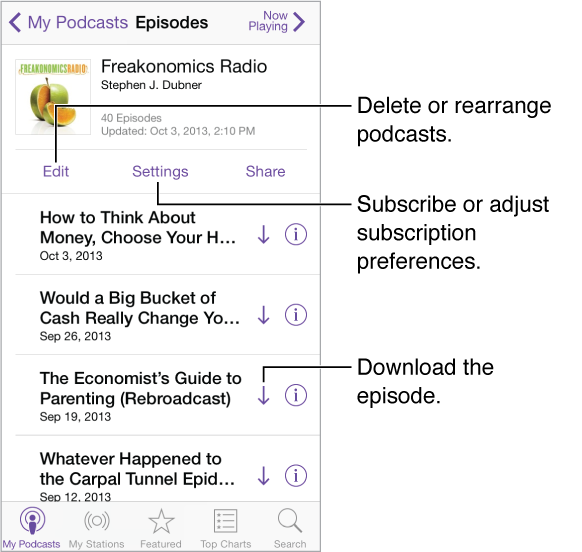 Browse for podcasts. Tap Featured or Top Charts at the bottom of the screen. Preview or stream an episode. Tap the podcast, then tap an episode. Search the store. Tap Search at the bottom of the screen. Search your library. Tap My Podcasts, then swipe down in the center of the screen to reveal the Search field. Download an episode to iPhone. Tap next to the episode. Get new episodes as they’re released. Subscribe to the podcast. If you’re browsing Featured podcasts or Top Charts, tap the podcast, then tap Subscribe. If you’ve already downloaded episodes, tap My Podcasts, tap the podcast, tap Settings at the top of the episode list, then turn on Subscription.